LAMP is gaining more participants! die Science Notes zum Thema Blockchain statt. Die Blockchain verändert gerade unser gesamtes Finanzsystem, doch das ist erst der Anfang. Die Forschungsgruppe Electronic Markets & User Behavior sucht studentische Hilfskräfte für vielfältige Aufgaben im Bereich Forschung und Lehre. Insbesondere wenn Sie an experimenteller Forschung im KD2Lab interessiert sind (vielleicht haben Sie sogar schon erste Erfahrungen als Proband gesammelt), haben wir sehr interessante Aufgaben für Sie. Einstellungskriterien sind hohe Motivation, ausgeprägte Team- und Kommunikationsfähigkeiten, sowie sehr gute Studienleistungen. Die Arbeitszeiten sind flexibel, Umfang 20, 30 der 40 Stunden pro Monat. Bitte senden Sie Ihre Bewerbung samt Unterlagen an (verena.dorner@kit.edu). Fertigstellung Debattenband "Big Data, Smart Data, next?" Prof. Dr. Christof Weinhardt is elected as Chairman of DIID’s Scientific Advisory Board Prof. Dr. Christof Weinhardt is elected as Chairman of DIID’s (Düsseldorf Institute for Internet and Democracy) Scientific Advisory Board. We are delighted with Prof. Thomas Setzer’s appointment as professor at the Catholic University of Eichstätt-Ingolstadt (KU) and congratulate him warmly. In cooperation with Cyberforum this one-day event is designed to help doctoral students in the field of information technology to explore the business potential of their research work. Final presentation Internet Business Models & Online Marketing In the course "Internet Business Models & Online Marketing" the students presented their elaborated business models to a jury consisting of Frank Schüler, Joachim Bernecker, Rico Knapper, Christof Weinhardt and Timm Teubner. 1. Platz für Dominik Jung (IISM) beim Duell der klugen Köpfe! Die neue Prognosebörse FAZ.NET-Orakel als Kooperation des IISM und der Frankfurter Allgemeine Zeitung ist nun online. Die Teilnahme ist kostenlos und jeder ist herzlich willkommen. Zeigen Sie, wie gut Sie Ereignisse in Politik und Wirtschaft vorhersagen können und handeln Sie Ihre Erwartungen! Auf die besten Händler in unserem FAZ.NET-Orakel warten Preise im Gesamtwert von mehr als 10.000 Euro. Dabei sein lohnt sich also! The Staatliche Hochschule für Gestaltung (HfG) and the Karlsruhe Institute of Technology (KIT) renewed their cooperation agreement for joint research, teaching, and innovation. The Institute of Information Systems and Marketing (IISM) is driving this renewed cooperation from the KIT side. Specifically, as part of the digital experience network various joint activities are planned. For example, in the practical seminar "Digital Experience" students from both institutions will jointly work on projects in the fields of user experience, gamification, and media narration. Wir freuen uns, Herrn David Dann ab dem 01.01.2017 als neuen Mitarbeiter für unser Institut gewonnen zu haben. Herr Dann wird die Forschungsgruppe Electronic Markets & User Behavior im Bereich Peer-to-Peer Plattformen unterstützen. 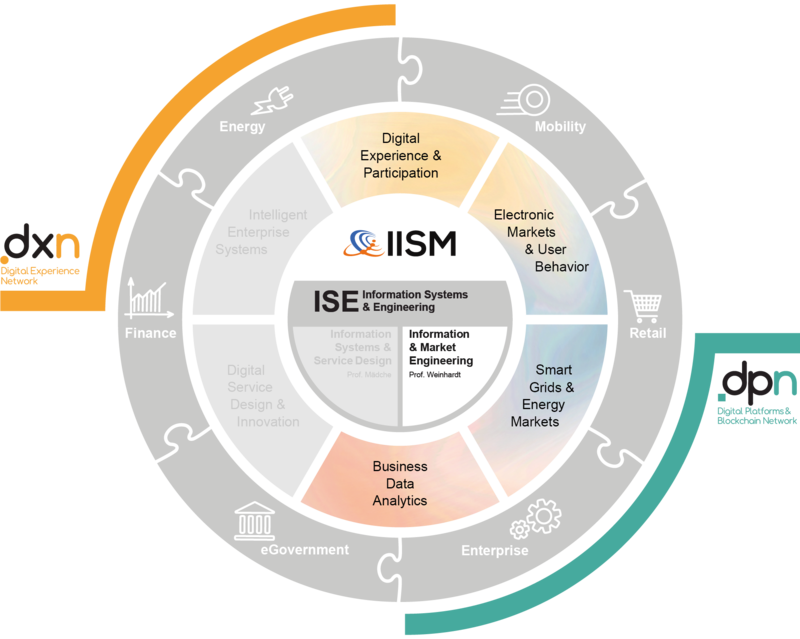 The IISM develops decentralized, blockchain-based energy markets. A household will be able to sell solar power to its neighbors on these local energy markets. The realization of such energy markets is becoming increasingly attractive. The IISM took part in the ewi Energy Debate Blockchain in Cologne and is also present at Microsoft and EnBW’s Hackathon regarding Energy Wallets. We are transitioning from ORSEE to hroot! Please update your user account in hroot. Prof. Weinhardt as Keynote speaker at Forschungsgipfel 2016 The Forschungsgipfel 2016 took place on 12.04.2016 in Berlin, giving leaders and experts from industry, science, politics and civil society the opportunity to develop concepts for the use of digitisation in Germany as a research location. Senacor provides the opportunity for students from business informatics, applied computer science and business with a focus on information technology to apply for the case challenge. The teams, consisting of three members, are going to compete for the Business Informatics Trophy 2016. Prof. Mädche will be a juror. Emotionsstufe Rot - Live Biofeedback in elektronischen Märkten Warum schlägt unser Herz schneller wenn booking.com uns wissen lässt, dass sich noch zwei andere das letzte freie Zimmer anschauen?